Longford's Darren Gallagher dejected. ©INPHO/Ryan Byrne. Longford have been left reeling following the news that impressive midfielder Darren Gallagher has left the squad. Gallagher was one of the shining lights for the Midlanders during their FL3 campaign with a number of sterling performances and finished as his county's top scorer with 2-22. The Longford Leader reports that Gallagher made the decision to spend some time in the United States this year and that move is about to happen. Obviously, Longford manager Padraig Davis is disappointed to be losing a player of Gallagher’s calibre ahead of the Leinster SFC. “Darren is an extraordinary player who was committed to us for the National League and what a brilliant season he enjoyed in playing a major role to consolidate the Division Three status,” said Davis. 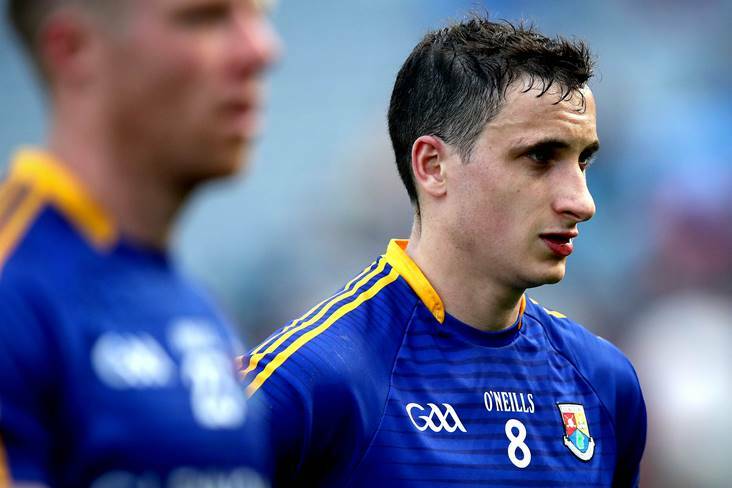 The news could get worse for Longford as it is believed that Rian Brady, Robbie Smyth and Dessie Reynolds are all heading stateside for the summer also.